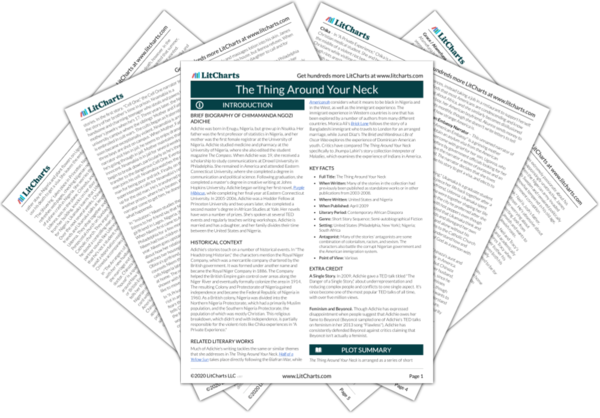 Instant downloads of all 942 LitChart PDFs (including The Thing Around Your Neck). Welcome to the LitCharts study guide on Chimamanda Ngozi Adichie's The Thing Around Your Neck. Created by the original team behind SparkNotes, LitCharts are the world's best literature guides. A concise biography of Chimamanda Ngozi Adichie plus historical and literary context for The Thing Around Your Neck. A quick-reference summary: The Thing Around Your Neck on a single page. In-depth summary and analysis of every Story of The Thing Around Your Neck. Visual theme-tracking, too. Explanations, analysis, and visualizations of The Thing Around Your Neck's themes. 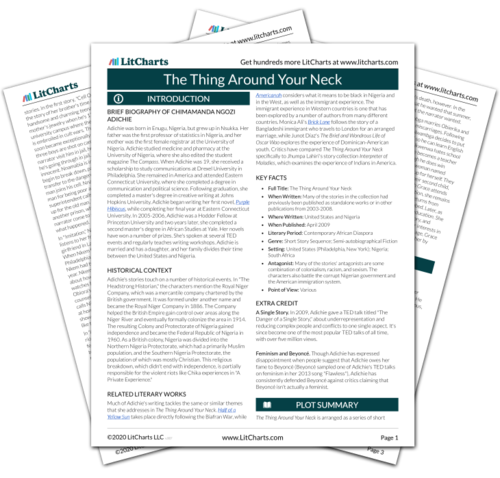 The Thing Around Your Neck's important quotes, sortable by theme, character, or Story. Description, analysis, and timelines for The Thing Around Your Neck's characters. Explanations of The Thing Around Your Neck's symbols, and tracking of where they appear. An interactive data visualization of The Thing Around Your Neck's plot and themes. Adichie was born in Enugu, Nigeria, but grew up in Nsukka. Her father was the first professor of statistics in Nigeria, and her mother was the first female registrar at the University of Nigeria. Adichie studied medicine and pharmacy at the University of Nigeria, where she also edited the student magazine The Compass. When Adichie was 19, she received a scholarship to study communications at Drexel University in Philadelphia. She remained in America and attended Eastern Connecticut University, where she completed a degree in communication and political science. Following graduation, she completed a master's degree in creative writing at Johns Hopkins University. Adichie began writing her first novel, Purple Hibiscus, while completing her final year at Eastern Connecticut University. In 2005-2006, Adichie was a Hodder Fellow at Princeton University and two years later, she completed a second master's degree in African Studies at Yale. Her novels have won a number of prizes. She's spoken at several TED events and regularly teaches writing workshops. Adichie is married and has a daughter, and her family divides their time between the United States and Nigeria. 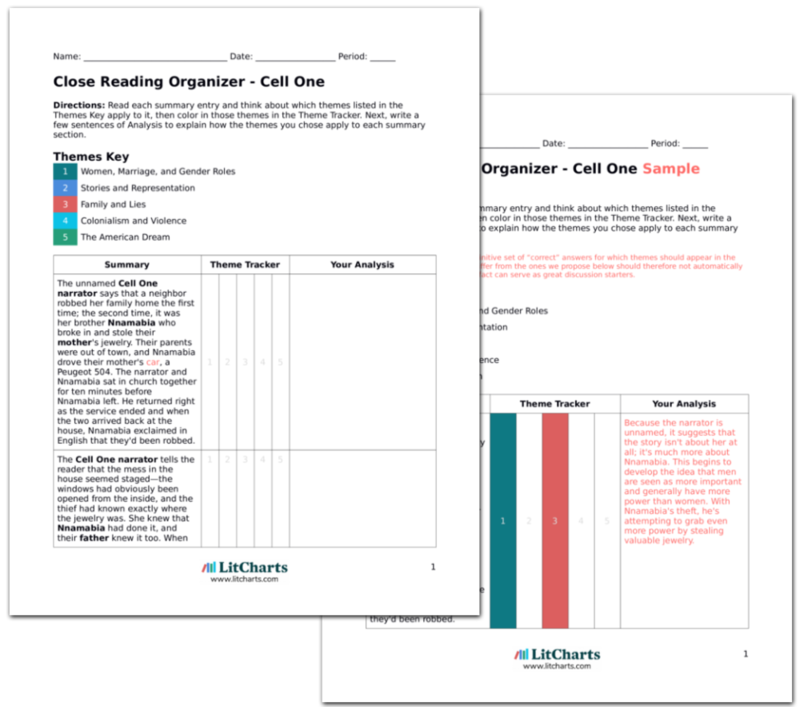 Get the entire The Thing Around Your Neck LitChart as a printable PDF. Adichie's stories touch on a number of historical events. In "The Headstrong Historian," the characters mention the Royal Niger Company, which was a mercantile company chartered by the British government. It was formed under another name and became the Royal Niger Company in 1886. The Company helped the British Empire gain control over areas along the Niger River and eventually formally colonize the area in 1914. The resulting Colony and Protectorate of Nigeria gained independence and became the Federal Republic of Nigeria in 1960. As a British colony, Nigeria was divided into the Northern Nigeria Protectorate, which had a primarily Muslim population, and the Southern Nigeria Protectorate, the population of which was mostly Christian. This religious breakdown, which didn't end with independence, is partially responsible for the violent riots like Chika experiences in "A Private Experience." Much of Adichie's writing tackles the same or similar themes that she addresses in The Thing Around Your Neck. Half of a Yellow Sun takes place directly following the Biafran War, while Americanah considers what it means to be black in Nigeria and in the West, as well as the immigrant experience. The immigrant experience in Western countries is one that has been explored by a number of authors from many different countries. Monica Ali's Brick Lane follows the story of a Bangladeshi immigrant who travels to London for an arranged marriage, while Junot Díaz's The Brief and Wondrous Life of Oscar Wao explores the experience of Dominican-American youth. Critics have compared The Thing Around Your Neck specifically to Jhumpa Lahiri's story collection Interpreter of Maladies, which examines the experience of Indians in America. When Written: Many of the stories in the collection had previously been published as standalone works or in other publications from 2003-2008. Antagonist: Many of the stories' antagonists are some combination of colonialism, racism, and sexism. The characters also battle the corrupt Nigerian government and the American immigration system. A Single Story. In 2009, Adichie gave a TED talk titled "The Danger of a Single Story," about underrepresentation and reducing complex people and conflicts to one single aspect. It's since become one of the most popular TED talks of all time, with over five million views. Feminism and Beyoncé. Though Adichie has expressed disappointment when people suggest that Adichie owes her fame to Beyoncé (Beyoncé sampled one of Adichie's TED talks on feminism in her 2013 song "Flawless"), Adichie has consistently defended Beyoncé against critics claiming that Beyoncé isn't actually a feminist. Brock, Zoë. "The Thing Around Your Neck." LitCharts. LitCharts LLC, 5 Oct 2017. Web. 20 Apr 2019. Brock, Zoë. "The Thing Around Your Neck." LitCharts LLC, October 5, 2017. Retrieved April 20, 2019. https://www.litcharts.com/lit/the-thing-around-your-neck.